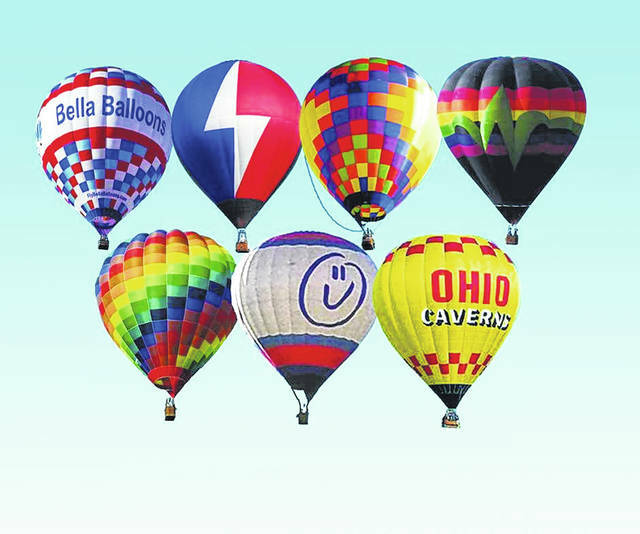 These seven balloons will participate in the Champaign County Balloon Fest this weekend, which will also include a REMAX balloon (not pictured). Eight hot air balloons are scheduled to participate in the Champaign County Balloon Fest from 4 to 9 p.m. Friday and Saturday at Grimes Field. Ticket prices are $2 for adults and $1 for children. Balloons will launch at 6 p.m. both days, weather permitting, and pilots will look for “friendly” landing sites within five miles of the airport. Property owners of open fields who wish them to land can place a white sheet on the ground, and pilots will use these markers as their targets. Organizer Sandy Gonzalez said the balloons typically stay in the air for 20-30 minutes before landing, then return to the air field by 7 p.m. to begin preparing for the glow, which begins about 7:15 p.m. She invited Champaign County residents and visitors to take lawn chairs to the airfield to enjoy the colorful sights. Balloon launch and balloon glows are controlled by weather conditions and are subject to change. In addition to learning about hot air balloons, Grimes Field visitors can join a Marco’s pizza eating contest at 6 p.m. on Friday and a Frickers chicken wing eating contest at 6 p.m. on Saturday. Miss Buckeye State of 2018, Abbie Davis, will be on hand for photos and autographs. Children’s activities will include face painting, a sack race, and a grounded balloon basket in which to take photos. Elton Cultice, airport manager and festival chairman, said a balloon fest hasn’t been held in Champaign County since 2012. Unlike some past balloon fests, this one will not include a carnival, he said. All money raised by the event will go toward funding this year’s event or next year’s event, Cultice said, adding the fest is a good way for people to stay engaged with the airport. The Champaign Aviation Museum will be open during the festivities and the Flying Lab will be on display. Volunteers are needed to serve as crew members for the balloonists. Crew members must be in good physical condition and able to hold roping as balloons inflate. For more information, contact Cultice at 937-652-4319.